Dolores O'Riordan's voice carried Linger from a somewhat over-produced ballad into something magical. The long leads - around two thirds of the total song - and the big chorus obscure my favourite part of the song: the beautiful lyricism of the verses. Almost every line is subtly different, with a quickening rhythm within each section that brings out the emotional toll of a one-sided, poorly communicated break-up. The Cranberries had many fine, under-rated, songs but only a few recaptured the same style that made Linger great - When You're Gone was probably the best of them, and a better song overall, but even it doesn't quite capture the same heights as those two verses. Paper Bag, the best song on Fiona Apple's ridiculously titled When the Pawn..., has a triptych structure. 75 seconds of syncopated jazz, concluding with the chorus. If that was the song, it would a be good song, about a paper bag. 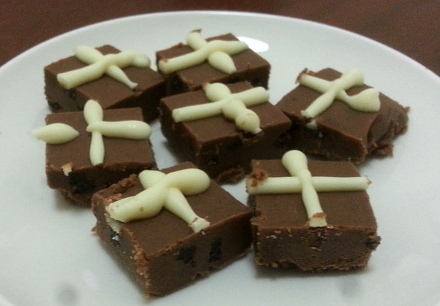 Perhaps the most belated of any chocolate recipe posts, but eh... This year I had help, as my old friend, A, who I recently reconnected with after eight years (old friends are the best! ), came over and provided essential suport in the rolling, pitting, and enlivening of what turned out to be a three day process. 1. Combine cream and glucose syrup and bring to boil, add the egg yolk and stir through to set slightly. 7. Dip in tempered white chocolate then grate some cinamon onto top. We took some inspiration from this recipe but had a spare egg yolk which added to the creaminess, and used a standard truffle mixture which I have a better sense of. White on white can be really sweet, but this was good. As here, or steps 1-7 above, dipped in dark chocolate, with grated nutmeg on top. Truffle mixture as here, or steps 1-7 above, dipped in dark chocolate. 8. A used a zester to knot some lovely orange peel onto the top. 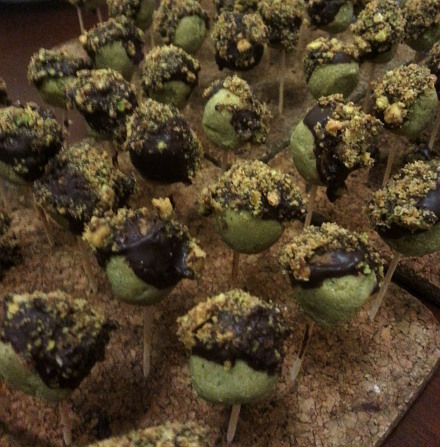 Create the pistachio gianduja as here, then pour into cupcake moulds and refridgerate. 1. Melt white chocolate and add cream, being careful not to split ganache. A relatively basic recipe, albeit one that burnt out my food processor makign the paste (cheap model it is), and with multiple steps. 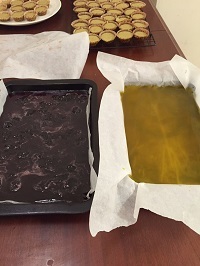 The photos below show various parts of the process: the Mayan chocolate before adding the coconut milk; the mayan and pistachio truffles after rolling and dipping; the two jellies - cherry and lemon/ginger tea - prior to adding the white chocolate nougat. Note the real chunks of cherry through the jelly. As here, but with more white chocolate in the nougat, and cherries instead of strawberries. 2. Put the guiness and chocolate into a pyrex bowl that will fit into the larger bowl. 4. Once combined, put into ice bowl and whisk vigorously for several minutes until a chocolate mousse forms. 5. Put into a piping bag and pipe small pieces onto a plate. 7. Dip each piece in tempered milk chocolate. The mousse part of this is based on Herv� This recipe, and will work for any combination of water and a little alcohol, or beer. It probably helps to reduce the guiness slightly, to make a thicker mousse that will hold its shape, but this worked too. Piping allows some more interesting shapes. There is a knack with the wrist and the height of the nozzle that took some adjusting too, but it is a handy skill. Mousse made in this way is phenomenally good and fast. It is a much easier process than the whipping and waiting if you just want to eat mousse. 3. Pour over chocolate in heat proof bowl, let sit for a few minutes then stir from inside out to create ganache. 6. 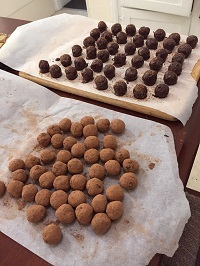 Using hands, roll into small balls, toss through cocoa powder, then leave to firm. We took this from an online recipe that looked promising. They went a little sour after a while (read: months), but were very good at first. Those were the successful recipes. There was another, which I won't recommend, but will describe. Make 500ml of boiling water with three tea bags of lemon and ginger tea, then pour into a bowl of packet lemon jelly. This, by itself, is delicious. Really delicious. But it makes terrible chocolate. Whatever is in packet jelly doesn't affix to the chocolate, and melts easily, so it can't be dipped, only poured into chocolate moulds. Also, the jelly has a limited shelf life, so it has to be eaten within a couple of days from the fridge. 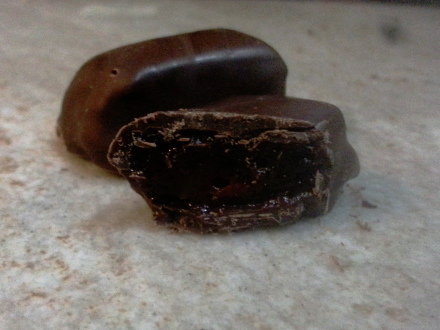 It is possible to make extremely tasty lemon and ginger jelly chocolates, but not with packet jelly. Better to have the jelly by itself (it is great for a head-cold), or in a trifle. A last note to thank A for the company, pictures, and presentation. That is all her. The good thing about slices is that provided you have time to wait for each layer to set, they are generally very quick, and very forgiving. This particular recipe was made up in order to try a particular technique - namely, boiling cream with coffee in order to make a coffee ganache. Everything else is just there to work around the coffee taste which is great, but pretty strong. 1. Combine ingredients, adjust liquid amounts to create something that holds together but no more. 2. Line pan with baking paper, press into pan. Bake for 10min to lightly brown. 1. Put Coffee Bag into Cream and bring to boil, remove from heat and let steep for a few minutes. 2. 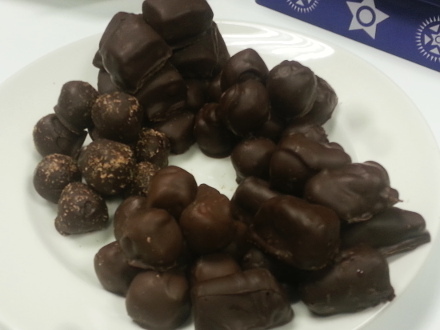 Remove bag and squeeze liquid from bag gently over chocolate. (If you don't have a bag, you need to strain the cream with a muslin cloth, replacing lost mass). 3. Add condensed milk to cream and bring to boil again, boil for a few minutes, stirring constantly. 4. Pour over chocolate, and emulsify by stirring centre then outwards. 5. Add Kahlua and melted butter, stir edges until no liquid remains on edge of bowl. 6. Pour over biscuit layer. And leave at least 1 hour to set. Not quite as easy. This is more fudgy than a typical ganache, but the condensed milk will thicken and caramelise a little, which is why it goes in after the coffee is removed. Coffee bags are a new thing, but they make this task a lot easier because you don't need to strain it; the light squeezing will capture a lot of flavour because the aim is to make this layer quite strong - almost inedibly strong, as it is offset by the sweetness and chewiness of the other parts. 1. Melt the white chocolate to 40degrees and stir in the cream and vanilla. 2. 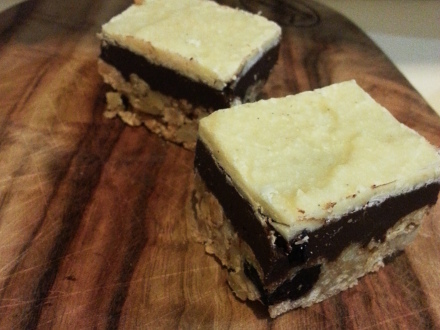 Quickly, with as few light strokes as possible, smooth over surface of the ganache layer. 3. Leave to set (1 hour). I hate white chocolate. Too thick. Too easy to over-cook. Too quick to set when worked. If you look carefully you can see speckles of unmelted white chocolate because this was a disaster. But no matter; that's the beauty of a slice. 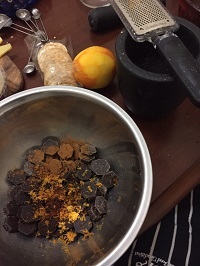 In short, the cream makes it easier to cut, because it is no longer pure chocolate but a really hard ganache, and therefore won't crack easily. Surprisingly, this worked amazingly well. Each layer is, by itself, extremely strong. The biscuit layer is almost pure nuts and berries; the coffee ganache layer is bitter and harsh; and the vanilla white chocolate is ludicrously sweet. But in combination they really came together. It could probably use slightly less biscuit, and slightly more dark chocolate (or just be thinner), but I'm quite happy with it. Not that you can really go wrong with a slice. Procrastination and a lack of other options saw a little baking tear on the weekend. An attempt at nougat, which may have been acceptable - is it possible to make sugar and honey inedible? 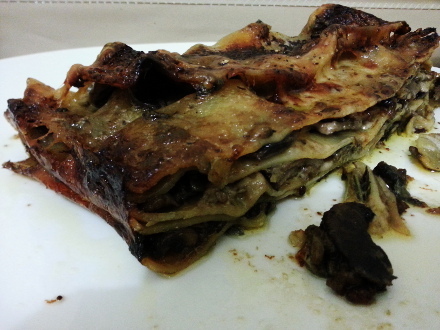 - but is probably over-handled and flat; and a lasagne which came out much better than expected, given it was mostly made up of ingredients I needed to use. I like traditional bolognese and bechamel lasagne, but it can come out very starchy. In the wonderful Snowflakes and Schnapps there is a lasagne recipe with veal and spinach that uses no tomatoes. This is a variation, heavy on mushrooms and earthy flavours. Quantities are pure guesses, but that's par for the course around here. 2. Add the mince and vegetable stock, fry until brown, then the mushrooms with a little butter, frying until soft. 3. Add the spinach, sage and enough white wine to de-glaze pan. Cook until spinach wilted and no liquid remains in pan. 2. Add remaining butter and flour, whisking until light brown, then while stirring, pour in cream slowly. 3. Add cooked mushrooms, blue cheese and spices, then cook until thickened, stirring often. Dried lasagne sheets, one box. 2. Alternate meaty part with a little truffle oil drizzled on, and cheesy parts with layers of lasagne in between, trying to get all the mushrooms from the cheesy part into the middle, and leaving just enough cheese sauce to coat the top sheet. 3. Coat top sheet with remaining cheese and Gruyere cheese, bake for 30min. If I was completely honest, it is a little oily, even by my very unconcerned standards, you do have to wonder about a thick pool of butter at the bottom of the dish. But the combination of multiple mushrooms and cheeses is such a rich meld of different earthy flavours is well worth it, and in any case, if it stays in the dish or on the plate, you've not eaten it. Variations to reduce the fat content are naturally available. Or you could run it off. I recommend the latter. One of my favourite little cooking references is the Flavour Thesaurus which makes the point that tomatoes and strawberries are very similar (albeit with the former having little to no sugar), and even interchangeable. 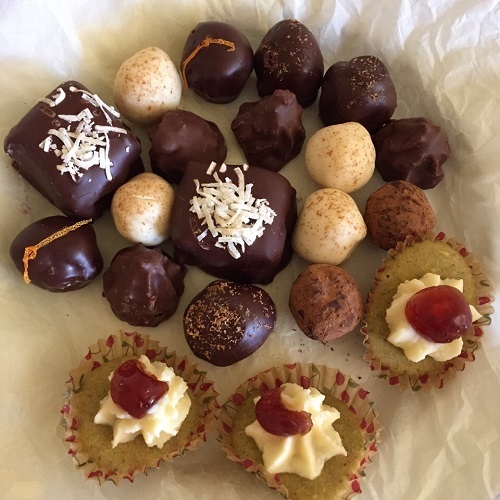 That led to a discussion, and then a challenge to make tomato flavoured chocolates, and hence the recipe below. The inverse - a strawberry pasta sauce will be tried shortly. The basic method and theme is the same as in this recipe. create a jelly, set it, coat it. You can do a lot more with the coating than I do, but I was somewhat rushed. 1. Prepare a slice-tin (approximately 25cm x 20cm) by lining with baking paper. 2. Hydrate the gelatin with the water, and melt in a water bath. 3. Combine the tomatoes, glucose syrup, sugar, vanilla paste, mulberry molasses, connamon and nutmeg in a saucepan and cook to 120degC, stirring constantly. 4. Pour mixture into another bowl, allowing mixture to cool slightly then add gelatin mixture and Galliano. 5. Pour into slice-tin and refridgerate until set. A standard jam recipe, and subject to change. I wanted to take the edge off the tomatoes because they have no sugar. This might have been overkill though, particularly the molasses, which had the side-effect of almost caramelising the jelly. Nevertheless, you can still taste the tomato if you know what you are looking for, and it turned out very tasty, but still slightly unusual, so the recipe is presented as done. Or at least, as I think it was done. I have no idea exactly how much spices and alcohol was poured in, but this is roughly right. 1. Melt and temper a large amount of dark chocolate. 2. Coat the jelly side of the slab with chocolate. Let set. As before, easy but tedious, notwithstanding keeping the temperature at the right level on which I am still working out the best method for repeated flash heating and remelting. Were I to do this recipe again I'd probably leave out the molasses, and maybe cut back on the vanilla. In general, when noone can guess the flavour, you've gone too far, and that is the case here. Just about every non-citric fruit in the spectrum was suggested before we got to tomato; so I'd like to retry with a slightly harder edge. It is possible the sugar is more than sufficient to make up for the lack of natural sugar, and the extra flavour isn't needed at all. On the other hand, the jelly is really nice, and offsets the dark chocolate perfectly, so it may not be an improvement if the next batch tastes more like a super-sweet chutney.